We are excited to be hosting a holiday breakfast and fundraiser for the 6th year in a row. This year, we are again hosting the longstanding BREAKFAST WITH SANTA at Bluegrass Yacht & Country Club. 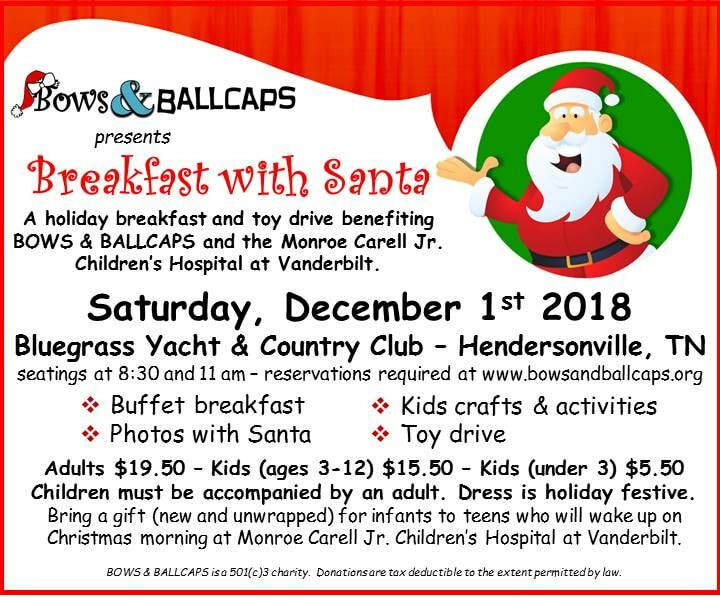 It will be an event with fun for all ages... a yummy buffet breakfast, pictures with Santa, crafts and activities for kids, and a toy drive for kids who wake up at Vanderbilt Children's Hospital on Christmas morning. Please join us Saturday, December 1st for this amazing event. There are two seatings at 8:30 and 11 a..m. Make your reservations early to get the seating you prefer. And again this year... ALL TABLES AND SEATS WILL BE PRE-ASSIGNED. More details are below, or contact us through the CONTACT US tab above or email us at bowsandballcaps@gmail.com with questions or for more information. We hope to see you there!! Check out these pictures from last year's amazing event! This year's BREAKFAST WITH SANTA will be even bigger and better than last year. We hope you join us and that it becomes a holiday tradition for your family. A huge thank you to Don Claussen at Trap the Light Photography for these wonderful pictures. Here are a few examples of the complimentary PHOTOS WITH SANTA that families receive as part of the event. We are so excited to have Leslie Wilkes Photography and SANTA joining us for another year of BREAKFAST WITH SANTA. All photos are available online by the end of the weekend.